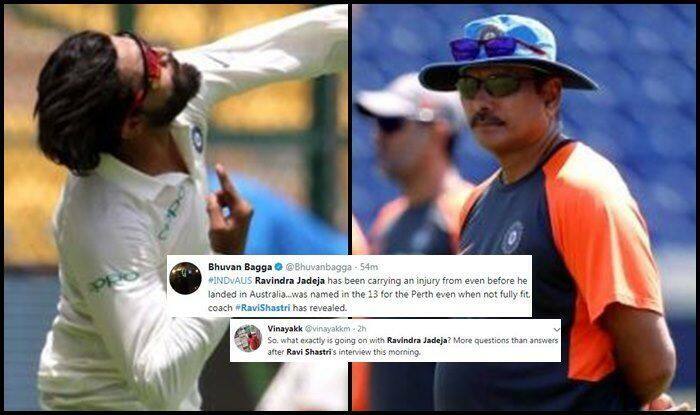 Australia vs India 3rd Test Melbourne: It seems India head coach Ravi Shastri has raised more questions than answered. Australia vs India 3rd Test Melbourne: It seems India head coach Ravi Shastri has raised more questions than answered. There seems to be a lot of confusion over Ravindra Jadeja’s fitness, where on one hand he was not picked for the Perth Test after being named in the 13-man squad. Now, Shastri has come in and in the presser at Melbourne said that Ravindra Jadeja was not 100 per cent fit and was only 70-80 per cent fit. On the contrary, he was used as a substitute fielder for the majority of the second innings of the Perth Test. Fans are confused and that also seems to be the state of the Indian cricket tea. Here is how Twitterverse responded to his convoluted statement. “Problem with Jadeja was that he had taken an injection four days after coming to Australia because of some stiffness in his shoulder,” Shastri said during a media conference. “It has taken a while for that injection to settle down. He had some stiffness when he was in India as well but he did play domestic cricket after that. Then he felt the same on coming here to Australia and he was injected,” Shastri replied but it did raise questions if the player travelled Down Under without being a hundred per cent fit. Shastri admitted that Jadeja’s recovery has taken more time than expected. “It (Jadeja’s recovery) has taken longer than we expected and we wanted to be careful. The last thing you want is someone breaking down after 5-10 overs and then we would be stuck for players to pick for Melbourne and Sydney. “So, looking back at Perth, we felt he was 70-80 per cent fit and we didn’t want to risk him in the second Test. If he is 80 per cent fit here (Melbourne), he will play,” said Shastri.